Sharp-eyes will notice that you're getting the October newsletter on November 1 ;) Well ... we've been really busy! 1. Sign up for early notification for our Black Friday deals so you don't miss out on the amazing but quantity-limited deals. This year, we have something totally new and it's related to FlyQ EFB version 4.0. 2. Speaking of FlyQ EFB 4.0, reserve your space now for the live Intro to FlyQ EFB 4.0 webinar on Monday, Nov. 19. We're limited to just 1,000 attendees and we had more than 1,600 people sign up last year for the intro to FlyQ EFB 3.0. FlyQ EFB pulls ahead of Garmin Pilot in terms market share. FlyQ EFB is the #2 paid-for app, behind just ForeFlight. It has also continues to be the #1 top-rated aviation app in the App Store. FlyQ EFB 3.3 and 3.3.1 released. Animated radar, massive battery life improvements, and lots of bug fixes and stability improvements. FlyQ EFB 4.0 ("Red Barn") taking shape. Two years in the making, FlyQ EFB 4.0 will change your perception of what an EFB app should do. iOS 12.1. FlyQ EFB and FlyQ InSight are cleared for iOS 12.1. You can use FlyQ EFB with your Garmin system via an inexpensive add-on. Read the details below. Our Facebook page has been substantially updated. Take a look at Like us! I'm Steve Podradchik, the CEO here. I write the newsletter so email me personally if there is something you'd like me to cover next month. And use the "Follow" feature on our Blog to keep up with daily news, product info, and more. We could sense it for a while but now it's official! FlyQ EFB has pulled ahead of Garmin Pilot in terms of market share. AOPA did a survey a few weeks ago asking people which mobile app they use. ForeFlight was #1 with just over half the market and FlyQ EFB was the #2 paid-for app behind it. Garmin Pilot was #4 -- behind the generic Other category. Full disclosure: FltPlan.com was 1% ahead of FlyQ EFB in market share but we think it's because the AOPA question specifically asked about mobile flight planning and lots of people use free FltPlan.com to plan then fly with other apps. First, sign up for the live intro webinar on Monday Nov 19 to be the first to see it. The Red Barn is the famous first Boeing building that changed aviation forever. We used that for a code-name because we think FlyQ EFB 4.0 will change the way pilots think about EFB apps and what they should do. It's not just a simple feature or two! The concept has been in the works for more than 2 years but we needed to add a few other features and backend technologies first to make it possible. That groundwork is now solid so the team is working hard to finish v 4.0. We're still working on the patent required for FlyQ EFB 4.0 so I can't say much but it includes aspects that will appeal to zillion-hour IFR pilots, weekend VFR warriors, student pilots, flight instructors, CAP pilots -- heck, everyone! Sign up for the free webinar now to learn more! The current version of FlyQ EFB is 3.3.1. You can check to see if you have it by tapping the Settings button (gear icon) at the top of the app. The version number is in the upper right corner of the page. 10/12: V 3.3 with animated radar, VASTLY better battery life and bug fixes. 9/20: V 3.2.1 added our exclusive ADS-B Buddy List and LOTS of bug fixes. 7/26: V 3.2. introduced our amazing (and patent-pending) Slingshot wireless ChartData system for in-panel systems and Stratus 3 support. 5/31: V 3.1 with automatic IFR ATC Routing, automatic fuel stop planning, full Leidos integration. We also expect to make a release this week or so that optimizes the app for iOS 12.1. To update, open the App Store on your iPad or iPhone and look in the Updates tab for FlyQ EFB. Tap Update. We get a lot of questions about using FlyQ EFB with the Garmin GTX 345 ADS-B system. Short answer: FlyQ EFB works great with the Garmin 345, albeit a bit indirectly. Longer answer below. First, it's important to understand that an ADS-B Out system does not need to talk to the iPad as Out does not send weather and traffic; only ADS-B In does that and the two do not need to be linked in any way. 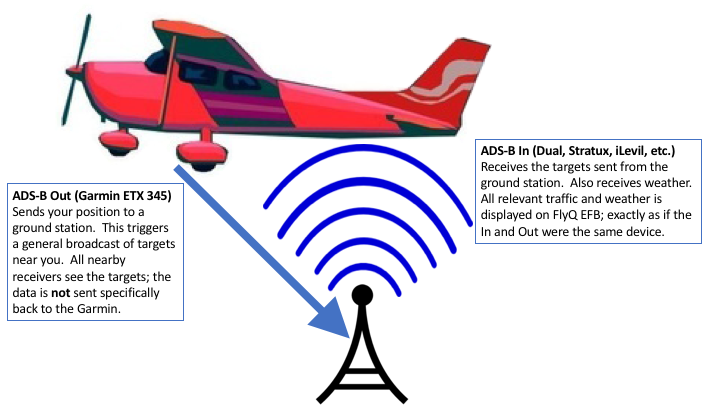 Also, the FAA's 2020 mandate requires just ADS-B Out; the FAA does not require any ADS-B In system so you're free to use any portable ADS-B In receiver you like or even no ADS-B In at all. ADS-B Out is basically just a transponder on steroids that sends your tailnumber and position to the ground station -- your current transponder doesn't talk to your iPad now, does it? The goodies for you, weather and traffic, are both provided by the ADS-B In system. Hence, adding our $249 Merlin ADS-B receiver (or a Stratus 3, Stratux, Dual, iLevil, or whatever you already use with FlyQ) to a Garmin GTX 345 installation will work great to provide weather and traffic to FlyQ. In fact, adding any ADS-B Out - Garmin or otherwise - makes all ADS-B In system work beautifully because the presence of an Out tells the ground station to broadcast all traffic relevant to you. The fact that the data is received by a Stratux or some other ADS-B In rather than the In provided by the Garmin is not relevant. In other words, FlyQ EFB works well with a Garmin GTX 345 so long as you also have some other inexpensive ADS-B In receiver. By the way, FlyQ now works with the great Stratus 3 line of systems. That also applies to the newest ESG ADS-B In/Out systems that use the Stratus 3i receiver. FlyQ does not work with the older Stratus 1 or 2 devices but Appareo (the manufacturer) offers a trade-in program! Another option for direct FlyQ EFB support is to use an installed ADS-B solutions from L-3 Lynx, FreeFlight, or more. Complete list. In-panel avionics are great but updating their data every month via USB sticks and SD cards isn't a lot of fun and takes serious time. Since Seattle Avionics provides our ChartData to 20+ apps and devices (BendixKing, Dynon, AFS, GRT, and many more), we invented a system called Slingshot that takes the data you have on FlyQ EFB and automagically wirelessly transfers it to experimental and certified in-panel systems, completely removing the monthly USB stick shuffle. This currently includes the BendixKing xVue Touch and AeroVue Touch and more vendors are integrating it now. Patent-pending. It turns out that iOS 12.0 and 12.01 included a fairly nasty memory leak deep in the bowels of the operating system. This most commonly manifested itself with FlyQ EFB running out of memory (i.e. crashing) if you downloaded ChartData for lots of states (or not too many states if using an older iPad). Apple released iOS 12.1 yesterday and, based on our testing of the earlier 12.1 beta releases, it fixes the memory problem but only after we recompile the app using the new development tools they released yesterday. We're in the process of doing that now and ensuring the leak is fixed and that other aspects of the app are fine with iOS 12.1. We expect to make a new releases this week or early next week that takes advantage of Apple's fixes. If you're not familiar with FlyQ Online, you should be! It's an amazing yet free web-based app for your PC or Mac. It brings weather analysis to a whole new level with our exclusive "4D" weather that adds a timeline and an altitude slider so you can see how weather is expected to changer over time and at different altitudes. FlyQ Online automatically optimizes your flights for winds aloft and finds you the least expensive fuel along the way and uses recently cleared ATC routes to plan your IFR flights. Automatically syncs with FlyQ EFB and exports to Garmin panels, ForeFlight, Dynon/AFS, and Google Earth. Seattle Avionics provides data for more than 60 countries worldwide. In the last two months alone, we added Brazil, Venezuela, Israel, and United Arab Emirates. At the same time, we also added the official Mexican VFR charts (Sectionals) to FlyQ EFB and most of our partner apps and devices. That's on top of the geo-referenced Mexican and Central American airport diagrams and plates we added a few months ago and the Caribbean plates we added last year.